Part of being an administrator for a dedicated server is the need to maintain your email service. If you have a problem with email, there are tools provided with WHM that can help you determine where the problem is occurring. The following article describes the different tools provided by WHM to troubleshoot your email service. 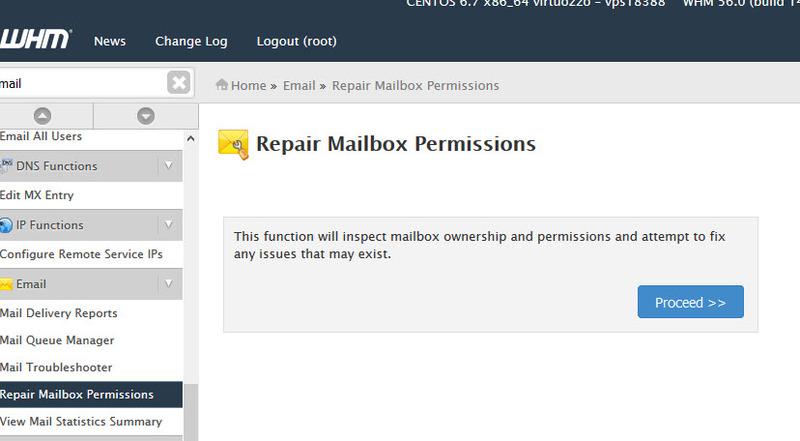 The mail delivery reports allow you to find and review messages sent from and received by your server. You can see the details for each message delivery as well as the details for each delivery attempt. 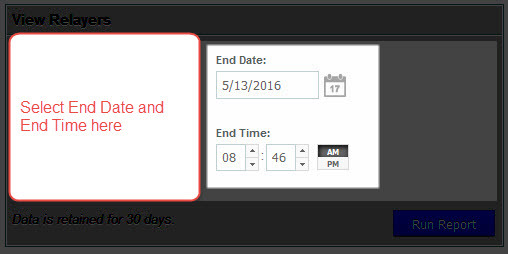 You can filter the messages using month, day, or year. Note that your queries can only return a maximum of 1000 entries per type. 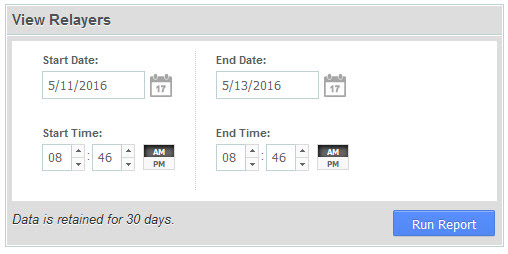 Data for email is retained for 30 days. You can use this report to determine if mail is actually being delivered. You can also see the details on mail that fails to be delivered. In the left-side menu pane, find Mail Delivery Reports under the Email section and click on it. You will see the Report Inquiry form. Select the search term by typing in a search box. You can change the type data you're looking for by clicking on the drop-down arrow. By default, it starts with Recipient. You can further refine the search by using the Search Type and Delivery type options. Select at Start and End date for the search. 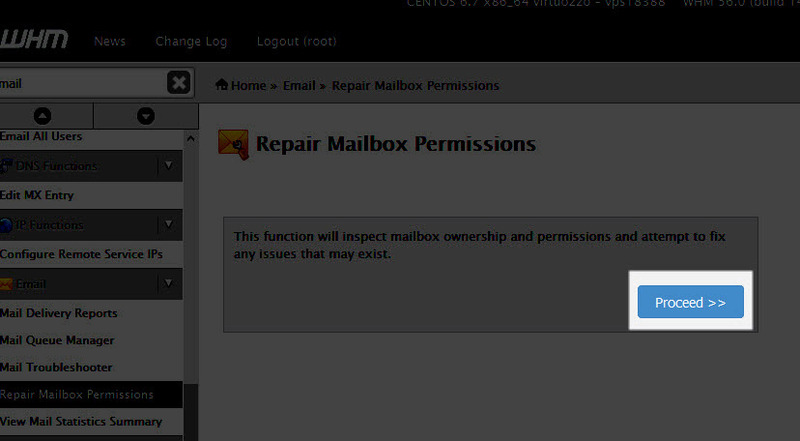 Select Mail Queue Manager from the menu at left. You can type in a search term in the Search box, and then narrow the filter to look for sender, recipient and message ID. You can further refine the search using the Search type. If your report finds anything in the queue, you will see them displayed in the table below. You can select each item (if there are multiple items) and then choose to Deliver or Delete the item in queue. 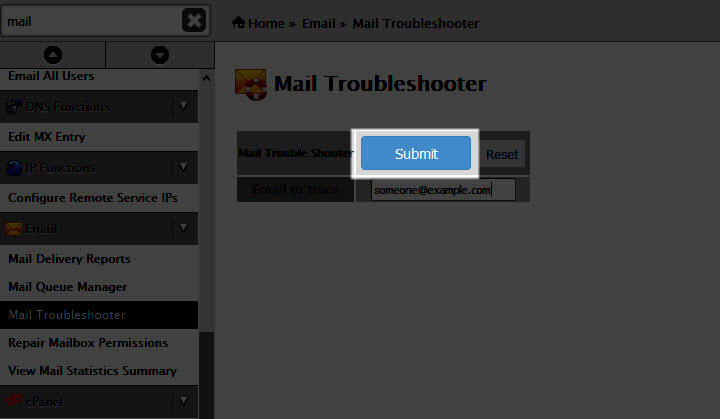 Select Mail Troubleshooter from the menu at left. 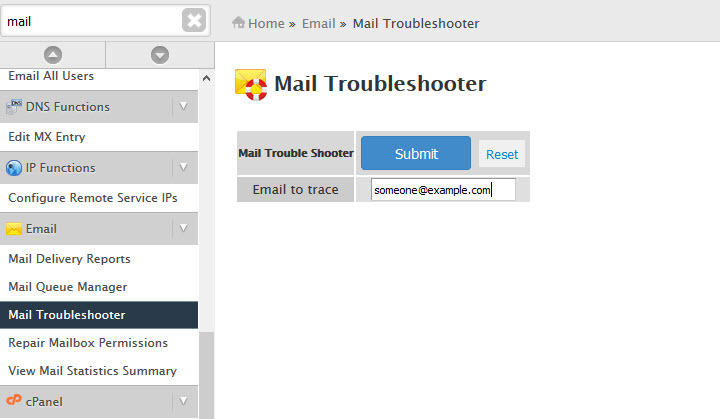 When the interface appears, you will see the small entry field labeled "Email to trace". Type in the name of the email address you wish to trace. Click on Reset to clear the field. Click on Submit in order to begin the trace. When the trace is complete you'll see details for the delivery of the email. The details provides information on the servers for the recipient. Click on Proceed in order to run the tool. The Mail Statistics Summary includes 18 reports that can help immediately pinpoint issues with your mail server. When you enter this section you will see a link for each report. Each report is represented by a graph or table below the link list. These reports are good for providing a quick overview of the email server as it operates. You may need to select a specific report depending on the problem that you are troubleshooting. In order to see each report, simply click on the corresponding link. This report allows you to see emails that have been relayed or forwarded within the time range that you select. Click on View Relayers in the menu at left. 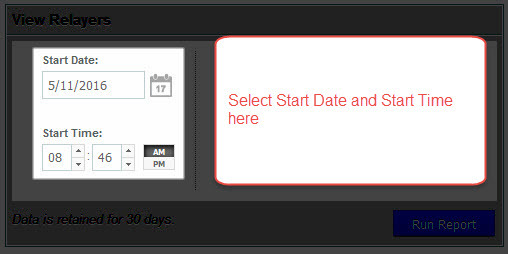 Select an End Date and an End time. 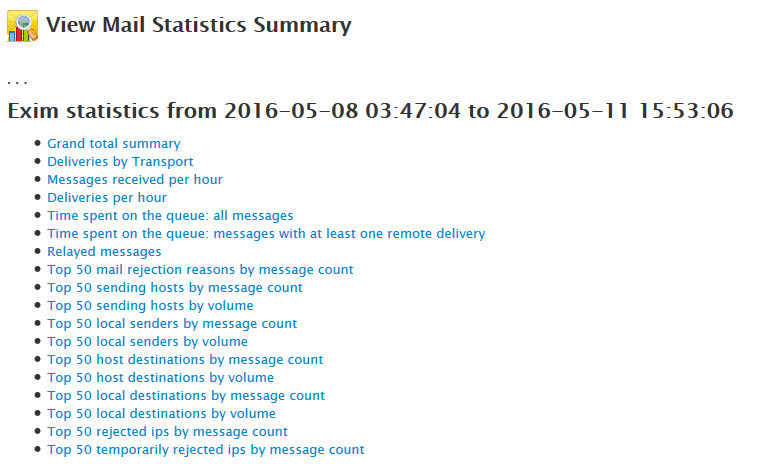 The Sent Summary report allows you see the total number of message delivery attempts for each domain. You will see the results organized by successful and failed attempts. 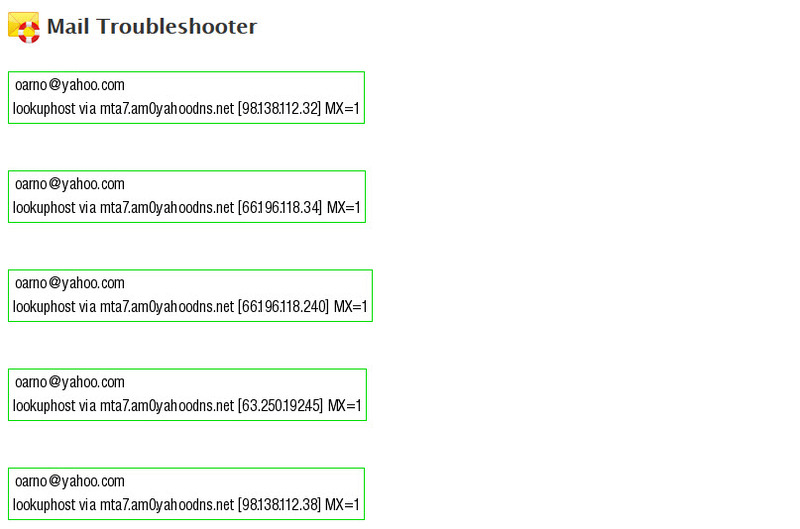 You will also see the total number of bytes sent by each domain. Click on View Sent Summary in the menu at left. This concludes the tutorial on using WHM Delivery Reports for email. If you use your dedicated hosting server for serving email, then you using these reports will help you quickly confirm delivery, or receipt of emails from your server. If there's a problem, you can use these reports to help you identify the source of the issues. If you are not able to resolve your email issues, then you should contact our live technical support team or the managed hosting team (contact info at the bottom of the linked page).